From back-end architecture to front-end tools, our migration specialists have a deep understanding of enterprise BI platforms and visual analytics tools. 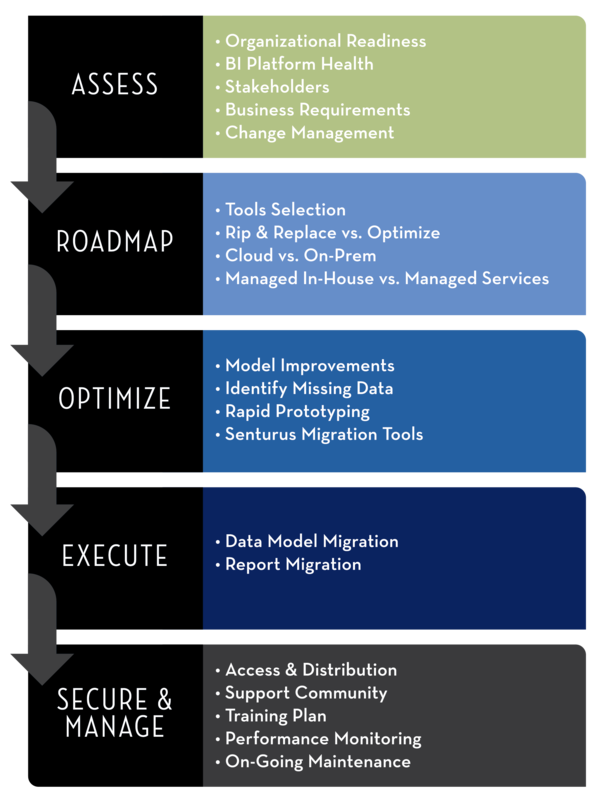 Implementing a structured process and using proprietary accelerator tools, we ensure rapid, optimized cross-platform migrations. We take best practices and business value into consideration, working on models in the areas that give the most business value. Further facilitating the smooth migration process, we can leverage our Analytics Connector to allow your organization to run the old and new platforms in parallel. Stakeholders can then take time to gain skills and confidence before the full migration. With the seasoned and knowledgeable Senturus team at your side, you will save time and money migrating to a new, stable system with minimal downtime to your end users. Converting to a new platform raises concerns because existing data models and business logic can get lost along the way. These losses would create a significant burden to the company in terms of lost productivity and the possible introduction of errors in the attempt to determine and recreate previously applied logic and calculations. To address this problem, Senturus developed migration tools that migrate data models and provide insight into report function, features and usage. We also help you migrate from on-prem to cloud platforms such as Azure and AWS. Migrating from Cognos Framework Manager to Tableau or Power BI? Try our FREE Proof of Concept Model Migrations and Report Rebuild!